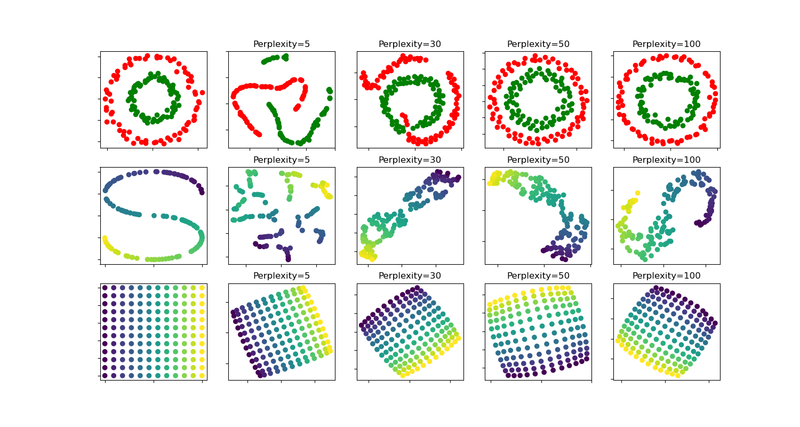 An illustration of t-SNE on the two concentric circles and the S-curve datasets for different perplexity values. We observe a tendency towards clearer shapes as the preplexity value increases. The size, the distance and the shape of clusters may vary upon initialization, perplexity values and does not always convey a meaning. As shown below, t-SNE for higher perplexities finds meaningful topology of two concentric circles, however the size and the distance of the circles varies slightly from the original. Contrary to the two circles dataset, the shapes visually diverge from S-curve topology on the S-curve dataset even for larger perplexity values. For further details, “How to Use t-SNE Effectively” http://distill.pub/2016/misread-tsne/ provides a good discussion of the effects of various parameters, as well as interactive plots to explore those effects.